Photo: ESO Online Digitized Sky Survey. Luyten 789-6 is a nearby triple star system (trinary), also known as EZ Aquarii, consisting of three red dwarfs. It lies 11.76 light-years (3.4 pc) away in the constellation Aquarius. The main component is also a spectroscopic binary. 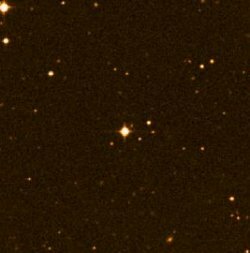 The system's nearest neighbor is Lacaille 9352 at a distance of 4.21 light-years (1.29 pc).